Are electric cars ready for mass adoption? Believe it or not the BMW i3 was unveiled back in 2013, long before Brexit dominated the news, and the presidency was just a glint in Trump’s eye. But despite that, it still looks and feels like one of the most futuristic cars on the road in the UK. On a basic level, the BMW i3 is an electric car with a pure electric range of 125 miles. It’s competes with smallish city cars like the Renault Zoe and Nissan Leaf. We actually test drove the Range Extender model, which has a small 647cc petrol generator bolted on. This doesn't drive the wheels, it just juices up the battery and adds as much as 80 miles to the i3's operating range. 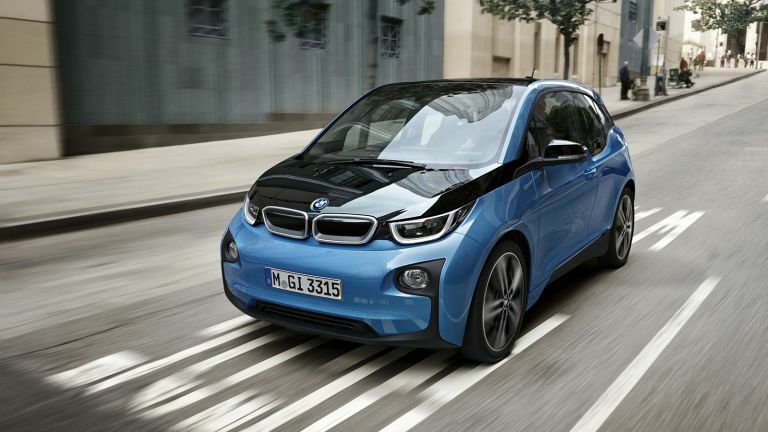 The BMW i3 was one of the first electric cars which, in our opinion, actually looks good. It’s distinctive, and looks futuristic. But it’s under the surface where the i3 really shines - it’s been designed from the ground up as an electric vehicle (unlike most other electric cars) and therefore is a lot more revolutionary than its competitors. It’s based around a carbon-fibre passenger cell with an aluminium subframe for the suspension, motor and battery pack. This maximised the space inside, while minimising the size outside. Just as radical is the i3's layout. It's not a conventional four-door car. Instead, you get two fun-sized rear suicide doors. Open all four doors for a stunning open-plan view of the i3's spacious interior. This does make accessing the rear seats a little awkward, but we still love the design. Tooling up for carbon-fibre construction is just the beginning of the i3's techfest. All i3s get Bluetooth, DAB radio, iDrive Touch, cruise control, BMW Business Navigation, BMW Online, BMW Apps and Advanced BMW ConnectedDrive. You’ll also get bags of clever connected and remote features. Things like streaming music from the internet and support for sending navigation destinations direct from your phone or laptop to your i3. Or unlocking remotely with a smartphone app. What we’re most surprised about is that everything we tried actually worked! We found planning navigation from your smartphone was the most useful, as well as being to pre-condition to cabin before you get in (especially useful on frosty mornings). The iDrive system took a while to get used to as it’s quite complex, but we quickly picked it up. Thanks to the instant torque from the electric motor, even the i3 Range Extender with its heavy lithium battery and petrol generator will hit 62 mph in 8.1 seconds. That’s impressively swift, and especially useful when darting around in London traffic. The i3, just like any electric car, is at its best around town. It's quick, it's responsive and it's refined. Even the best combustion cars make noises, shift gears and take critical moments to respond to throttle inputs but the i3 is silent, and quick (yet also relaxing with great visibility). Out of town, it's a slightly different ballgame. There's enough wind and tyre roar to bring you back to reality and the performance tails off a little at motorway speed, so the experience isn't quite as magical. When we first received the i3 we’d try to charge it at every possible opportunity, and suffered from major range anxiety. But after some time with the vehicle, we quickly became more relaxed, and would let the battery run down to around 10-percent before we plugged it in. That’s where the petrol generator comes in useful - it provides peace of mind. But obviously, while the electric range worked for me, it might not work for everyone. If you do find yourself 40 miles from home with 30 miles of range left, you can hop from Comfort to Eco mode (or even Eco Pro). This will turn the radio and air conditioning off, to eek out as many miles as possible. Perhaps the biggest challenge we found was getting used to the art of ‘single-pedal driving’. This is predicting when you’re about to stop, and using the energy recuperation to bring you to a halt rather than your left foot. If you can’t already tell, we’re super impressed with the BMW i3. Four years on it’s still a radical machine, with its carbon construction and open-plan interior adding to the wow factor. The net result is a car that feels like the future. It makes conventional combustion cars seem like wheezy, late-Victorian throwbacks. The recent updates have improved the range, and introduced faster charging, taking as little as three hours to fully replenish the batteries. Yes, the initial cost of an i3 is a little on the steep side, but the day-to-day running is cheap as chips, and you’ll get privileges such as reduced free congestion charge and free parking in Westminster. What’s not to like?